Account-based strategy is the coordination of highly valuable, personalized experiences across all functions that impact the customer to drive engagement and conversion at a targeted set of accounts. 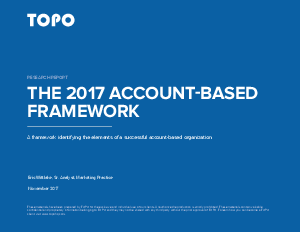 The adoption of account-based strategy has accelerated in the last few years, with a dramatic increase in the number of companies looking to implement this approach. This growth is driving demand to “start now,” particularly in marketing organizations, but account-based cannot be developed by the marketing department alone. The best account-based leaders begin by securing organization-wide commitment to the account-based strategy.